Write a brief description of this painting of Ned Kelly. What do you think it is saying about Ned Kelly’s status in the 20th Century. 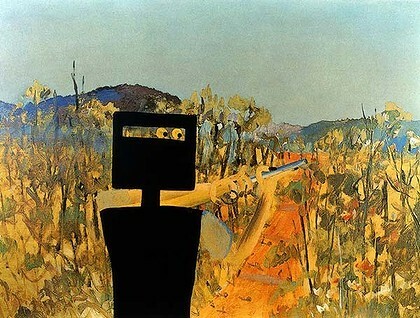 This painting contrasts the bright Australian landscape against the image of Ned Kelly wearing his armour. Through the visor in the helmet we can see his him staring intently at something in the distance; whist holding his rifle in both hands. This painting highlights the isolation and alienation Ned Kelly faced as an outlaw. Through the contrasting of bright colours against the black armour of Ned Kelly, it is shown that he does not fit in with the environment around him. When we look at the eyes through the visor, the caution and preciseness that Ned Kelly had to work with is evident. His persona in this painting is portrayed as criminal, however, it could be said that his persona may be one of fear. This may be a depiction of the events after the shootout at the hotel with police when Ned Kelly fled into the bush after being wounded. If this painting was to be interpreted under these terms; an atmosphere of fear may be a plausible observation.